Over time I have accumulated fabric. In the beginning it was mostly children's prints since I was sewing mostly for babies but then I discovered Heather Ross and Denyse Schmidt and that is where my real stash began and my scraps! 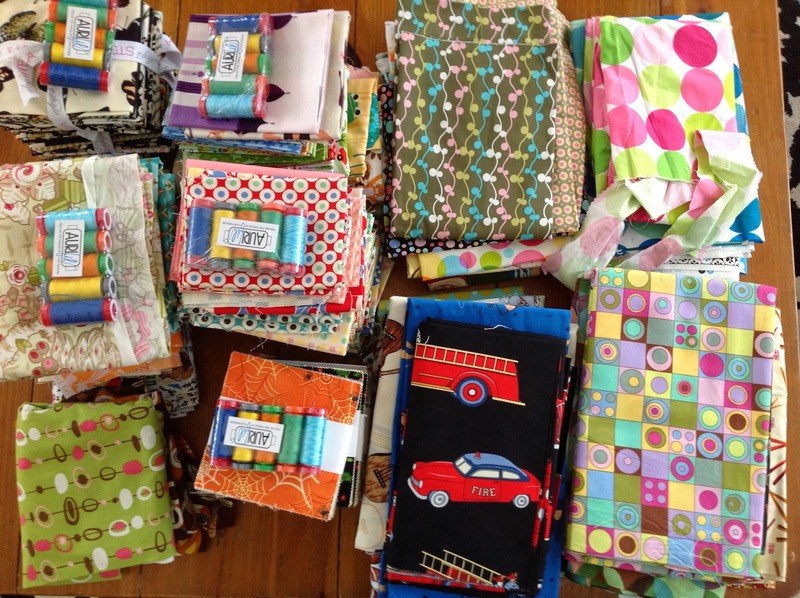 If you are a scrappy quilter it is a good thing to have many fabric scraps to choose from. I love scrappy quilts like the scrappy Courthouse Steps Quilt. There is not a repeat fabric in any of those blocks. I LOVED making it. When pulling fabric for the Baby Love quilt I realized how terrible my stash had become. It was not working for me, I was fighting with it. It has been a long time coming but in the past four or so months I have not had the time or energy to keep the disaster at bay. It took me forever to go through ALL the piles to find what I needed. When I had the quilt top completed, I folded and fabrics and placed the correct scraps in the correct bins...IT WAS AMAZING! So I did what any crazy quilter would do...I went into my sewing room and started DUMPING all the fabrics on the floor to sort through them. This is my sewing room TOSSED! It was easier for me to just yank everything off the shelves, throw it down on the ground and sort through it. I put my piles O Pellon in the corner for safe keeping and then went to folding and sorting. By this afternoon, I was here. I have some colors sorted and stored properly. I still have many to do but am pleased with the progress I am making. We already had to upgrade to larger bins for the blue and green scraps and we have a ton to go...YIKES! The best part of all of this is I am also going to be destashing. I will not be selling or trading but I will be having a series of giveaways. The one caveat is that you are a friend ( follower) here on my blog. This is a sample shot of some of the giveaways. 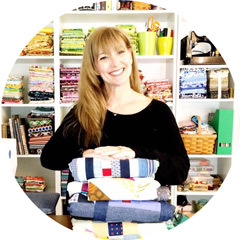 There is TONS of great fabric here that is not getting love and I believe ALL FABRIC should be loved! So stay tuned for news on the giveaways. They will hopefully be this week, if I can get the weather to cooperate. I've been doing the same thing this weekend, except mine was a lot worse, it was a catch all for all the family junk :( I am able to see the floor now, that's a bonus! Still have to sort my scraps though. I may actually be able to sew in there this week! 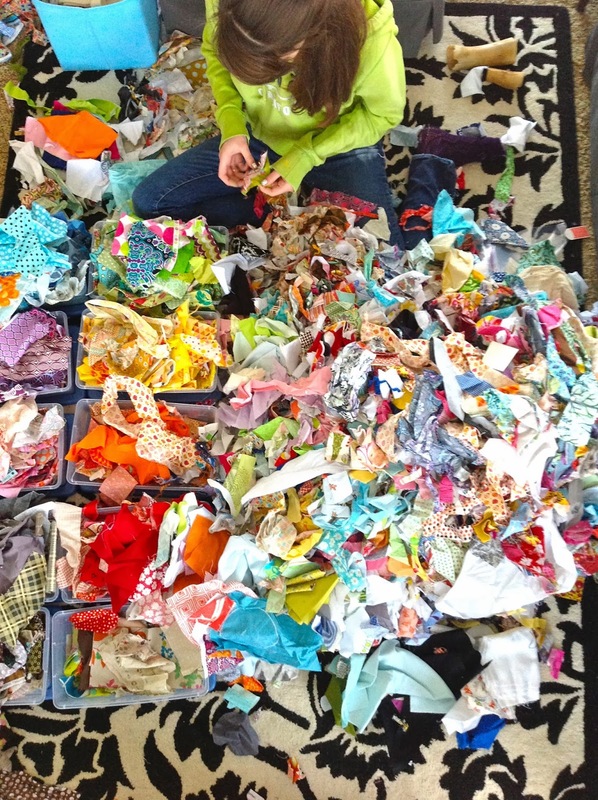 I love the crazy pile of scraps! Earlier this year, our guild has a workshop with Victoria Findlay Wolfe and she brought in two or three white garbage bags of scraps for us to use. It makes me wonder if she brought that many for us, how many/how often do those scraps accumulate? (and then I don't feel so bad about my three little rubbermaid boxes of scraps) Anyway, you giveaways will be fun to watch for! WOw!!! I love that picture of you with all of the scraps! Though the shelves of pretty fabric look great also. Good luck finishing up the scraps! Oh my word. That's a lot of scraps! The shelves look so happy with rainbow-y goodness! I thought I had a lot of scraps, but mine do not even compare. That's a lotta scraps! Great minds thinking alike! I'm doing the same thing. Except you're way ahead!!!!!! It's looking great and thanks for the inspiration. Wowza! If you happen to have too many scraps and feel the need to... ahem... re-home them I'm sure you'd find plenty of scrap addicts (myself included!) willing to take them off your hands. I can't wait for the giveaways! The cabinet looks great with all those folded pieces in it. I can't imagine how great it felt to dump everything, look at it all, and then have time to sort and store realizing what you will really use. Now you have beautiful shelves and wonderful scrap bins/buckets to show your hard work paid off! I try to pretend I don't have too many scraps....after all, if I spread them out over 4 rooms in the house, there's less...right? 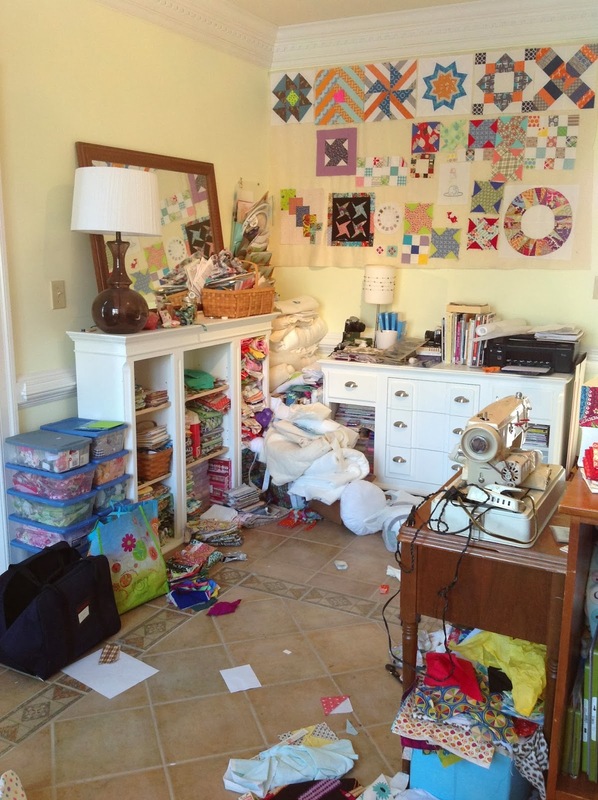 Also, my sewing room looks like yours when you tossed it...that, ahem, it mine's natural state. omg! omg omg OMG!! I see lizzy house!!! Love scraps and could always use more. Good for you to sort and clean up. Wow you got a lot of fabric good job tackling it! I love your courthouse step quilt. I wish I had as much scrap! Your courthouse steps quilt is lovely. And your scraps are amazing! Good to have a little helper for tasks like this. you sem to be having a great time with your sort out. Like the way you have the fabrics on shelves, I store my in drawers but much prefer your way. See what you mean about scraps, I have very few but no doubt the pile will grow as I quilt more. Wow, what a sort out! I have been forced into clearing my stash a bit recently as we moved house, but it wasn't quite as bountiful as yours! Love the way its displayed in the shelves. Going to show those pics to my husband to prove I do not have a problem!! You are an inspiration to get mine done! I just have not wanted to spend the dumping 3 closets to reorganize them. On the other hand I think of the time I waste looking for something I know I have. Not so long ago, I did the same. It took about three days to clean up my sewing room, but when it was done it felt amazing! Good luck finishing yours! There is nothing that I love more than bringing order to chaos! I love how you stored some of your scraps in large mason jars on top of the bookshelf. :) I'm going to have to remember that idea. ...If you can find a way for the weather to cooperate, we'd ALL be grateful!! I think the entire country is tired of hearing about or living with this horrible, cold and snowy winter already! Oh Wow! you've got lots of fabric and scraps ~ me too. I went through some of mine the other day and sorted out some I don't want any more. What a great idea to do giveaways! 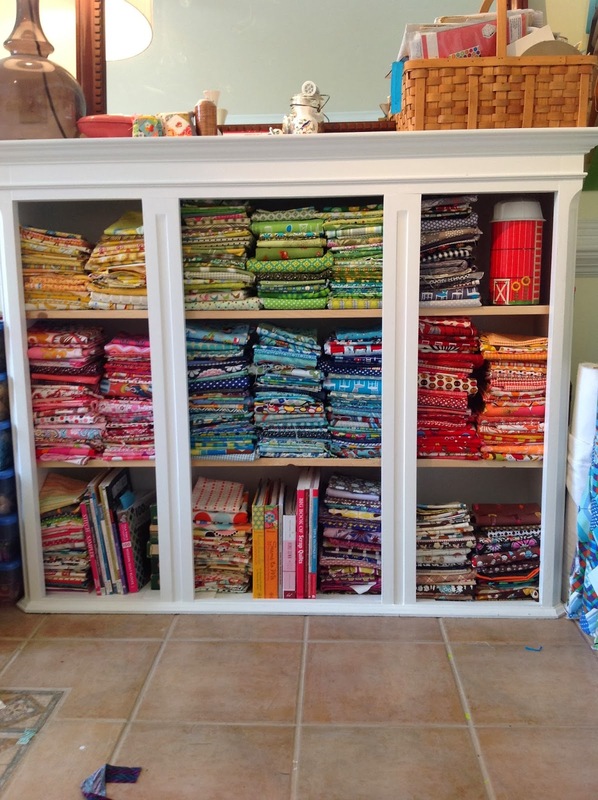 I love that you have the Little People silo in your fabric cabinet~! ahh yes. it feels good to organize doesn't it? though i too ended up making a huge mess along the way. looking good. I have been going through my scraps as well. It is nice to get things organized. My guest room is where I store my fabric. Hopefully no one comes to visit fir a while as my dusters and I trashed it when we were working n Christmas projects. Love the before and after pictures! I've started going through my scraps too and it's a huge job, but worth it. Enjoy the result! We just moved this weekend...and the loft/bedroom/sewing room is big enough for more books shelves...ie: I get to have my pretties out with me instead of shoved into a closet! Awesome job you did there! Looks great. What size does you smallest scraps have to be before you keep them? I think I am keeping too many. Also, do you square them up or do that when you use them? Ouch, you must be tired! Thanks for the warning - I better get a grip before I'm in the same boat! Wow! I couldn't imagine having that much in scraps or fabric. You're a lucky girl. When you post your giveaway, please be sure to add it to the weekly giveaway link up on my blog. Thanks! One day I want to come and visit, just to ooh and ahh over the collection of fabulousness! Good job tackling that project. My sewing space and fabric need a major overhaul. I'm trying to only purchase to add to a project, and not for an entire project, if that makes sense. Both of my current projects are from my stash. I tend to stuff my scraps in a large plastic Ziploc, but I haven't sorted them! Cheering for you, Kim! It makes a world of difference to sort it all out and make the tough decisions (what stays and what goes) with your stash, but it's so worth it. I had to do this myself, recently and it felt so good afterwards (to not only be able to find what I wanted, when I wanted but to pass on fabrics to others that would love them). Bravo!!! That is a major undertaking! 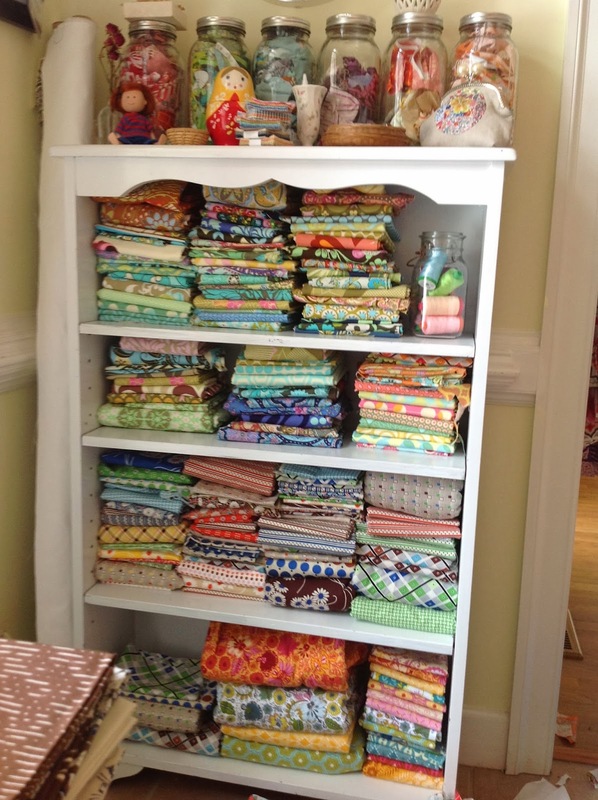 But, don't you love the feeling of having an organized and clean sewing room? I did this not too long ago and it is so much nicer having everything organized and in its place. Although I don't have as big a stash as yours. :-). I'm looking forward yo your giveaways, so maybe I can add to my stash. Look at all those scraps! You will definitely use them more now they're sorted into colours. Best thing I ever did with mine and I don't have quite as many as you! I just got a new set of drawers and have just put all my fabric in them after having had to store it in plastic tubs for years. So much easier on my back! Lizzy House, Halloween and Aurifil?! How exciting :) That is a huge pile of scraps. I'd like the think I don't have that many but methinks I protest too much. Except I usually end up with tons of small triangles. Cuteness, don't feel bad about my room, more importantly, no matter what your room looks like, you have those fabulous windows to look out of everyday. Super stash, super giveaways in the future! It is so hard to take the plunge and begin organizing but it feels amazing about half way through and then totally exciting when you're done. Good luck and great job! I've stored my scraps according to size regardless of colour but after seeing you on the floor with all the colour baskets I think I may change my storage system. Thanks for sharing. I think we all understand. I couple of months ago I dumped out all my scraps too and sorted them by color. This year I'm going to actually use some of them up. You've inspired me to sort mine. Your quilt is beautiful. Officially, my son would love that fire truck!